Awakening - what does that mean? My online dictionary says the noun means "the act of awaking from sleep". Or "a recognition, realization, or coming into awareness of something". Both definitions are appropriate for this month's Picture This contest at Gardening Gone Wild. Awakening for me means the earth has broken its winter slumber and suddenly there are little harbingers of spring to be seen. In my past life (pre-Louisiana) I could hardly wait to see the bluebonnets. Every trip up the freeway to work was a scouting trip for the first bluebonnet. Today, spring harbingers for me are the daffodils that line the roads, marking old farmsteads and homes. There's a great variety of them: Sweeties, Campernelles, Butter and Eggs, many more. This unknown variety pictured above shows up in my yard just after the Sweeties start blooming. This is now how I awake to spring. Jean, I couldn't agree with you more. 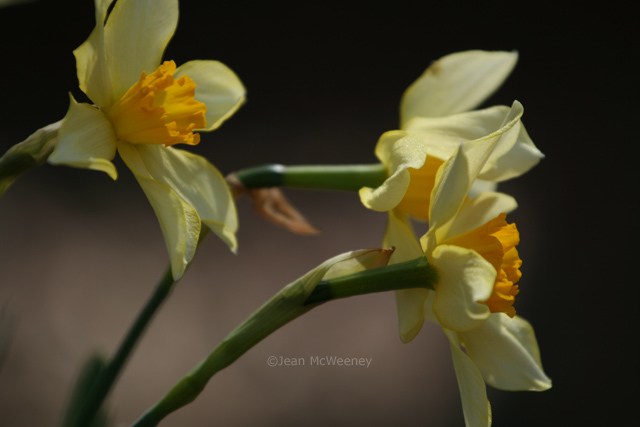 Nothing says spring is here and things are warming up like Daffodils! Just beautiful! I love Daffodils & can't wait to see them lining some of the roads around here. Nice daffs! Can you believe I've *never* seen a bluebonnet (in real life)?! How are you liking Lovejoy? I've just started season 3 of Deadwood, where Hearst's captain beats Swearingen. Lovely daffodils, a sign spring is almost here. "Sweeties": is that a daff category, flower style or local nickname? New to me, but I love it and can just imagine see all the sweeties in my garden! Linda - sorry not to explain but Sweetie is the local common name for Narcissus jonquilla, the tiny little jonquils that come up first. Monica - It doesn't surprise me you haven't seen a bluebonnet in person. You really must get yourself down to Texas in spring! I'll email you about Lovejoy soon. Just started it. Thanks for dropping by my blog. I live in North Florida, so I'm south of you a little bit. It seems like every day I see something new blooming. Your daffs are so pretty. I think that I like them more and more each year. Our daffodils opened only a few days ago. Enjoyed the photo and my visit! Our bluebonnets are just getting ready to flower. Tried them in some of our median plantings this year. Success is coming our way with that one. Really loved your photo, I even turned the laptop around to show my husband. I'll be surprised if you're not one of the final choices. What could be springier than the sweet trumpets of daffodils! After a cold dreary winter, the sight of daffodils gives so much hope of what is to come.....enjoy your spring blooms. Jean, I agree with other commenters - it's a very pretty picture! I like a light/shade play. Good luck! I've been out in the garden every chance I get, making me fall WAY behind in reading my favorite bloggers. I'm all caught up with you now and am just wild about all those daffodils/jonquils/narcissi you showed. I've decided I need more bulbs! It's hard not to luv a daffodil named Sweetie. Your daffs are so pretty- a wonderful photo. I enjoyed all of your photos scrolling down the page, especially the chickadee's moving in to the birdhouse. Beautiful photo, Jean! I agree that daffodils are the signal that spring has arrived. I was excited when I got back home this week to see that my crocuses had finally bloomed, but once my daffodils open up, I'll be really excited. Good luck in the contest!